Enermax has announced the impending launch of the Thormax GT, a full-tower case designed to accept boards up to E-ATX in size. Designed for high-end system builders who don't want to be constrained by capacity, the meaty Thormax GT boasts support for up to four dual-slot graphics cards with lengths up to 360mm or two up to 490mm when the hard drive cage is removed. 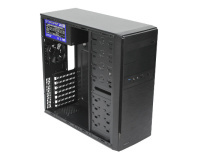 Four 5.25" bays are exposed on the outside, while the case supports five 2.5" or 3.5" internal drives with a sixth 2.5" mounting point hidden behind the motherboard tray. A 'cooling compartment' design supports two radiators for liquid-cooling systems, a 360mm unit in the roof and a 240mm unit in the floor. 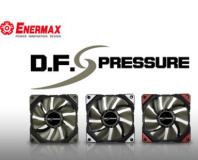 Additional cooling is provided by a pair of 180mm Enermax Vegas fans with blue LED lighting, which can be expanded with the addition of up to six more 120mm or 140mm fans in various positions. 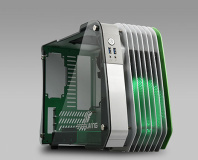 The case's top input-output panel includes two USB 3.0 and four USB 2.0 ports, and power and reset buttons. A four-channel fan controller with LED speed indicators is also bundled and broken out at the top. Interestingly for a full-tower design, Enermax has added features which appear to be aimed at the LAN party enthusiast: a magnetic headset holder attaches to the side panels, while the rear roof area includes an integrated metal handle for carrying. Additional features of the design, which Enermax first showed off at CeBIT earlier this year, include feet which rotate through 360 degrees and a bundled 5.25" bay adapter supporting one 3.5" or two 2.5" drives. The case is due to launch in mid-October with pricing yet to be confirmed, and is not yet listed on the company's official website.